REDDING, CA--(Marketwired - Nov 3, 2015) - Dr. Michael Sumsion, a board-certified ophthalmologist, says that LASIK surgery is one of the most popular vision correction procedures he performs at Riverside EyeCare Professionals. However, since not every person who wants to reduce or eliminate the need for corrective eyewear is an ideal candidate for LASIK (or LASIK alternatives such as PRK), he says he is happy to offer his patients another effective option: Refractive Lens Exchange (RLE). Dr. Sumsion explains that by swapping the eye's natural crystalline lens with an artificial intraocular lens implant (IOL), he can dramatically improve the vision of his patients. He says, "With recent advancements in lens technology, restoring vision through RLE has never been better!" According to Dr. Sumsion, RLE can be hugely beneficial for patients who have eye conditions that rule out LASIK and other laser refractive surgeries as options for vision correction. "Many of our patients who want to improve their vision have either severe refractive errors or an abnormally-shaped cornea," says Dr. Sumsion, and both of these conditions could make a patient ineligible for laser vision correction procedures. He explains that RLE is an especially good option for those with the beginning stages of cataracts -- noting that sometimes cataracts can begin developing at as early as 40 years of age -- and the cataract will need to be removed at some point to restore optimal vision. He also highlights that RLE can produce results that are comparable to LASIK surgery, and can serve as an even more effective solution for patients with hyperopia or presbyopia. As an added benefit, Dr. Sumsion says that RLE can be especially advantageous for patients with cataracts. "RLE can often be performed in conjunction with cataract surgery, allowing your board-certified Ophthalmologist to remove the cataract while also correcting other vision impairments," says the Redding cataract surgeon. In addition, Dr. Sumsion notes that lens implants can eliminate a patient's risk for developing cataracts in the future. Ultimately, Dr. Sumsion says a one-on-one consultation is needed to truly discover the best vision correction approach for a patient's unique circumstances: "During the consultation process, we will perform an eye exam, review your medical history, present you with your treatment options, and help you make an informed decision about your eyesight and your health." Board-certified ophthalmologist Dr. Sumsion has been practicing in Redding, CA since 1990. He specializes in treating a wide variety of eye conditions using state-of-the-art technology and techniques, including cataract surgery and LASIK laser vision correction. Dr. Sumsion is an active member the American Academy of Ophthalmology, the American Society of Cataract and Refractive Surgery, and the American Medical Association. 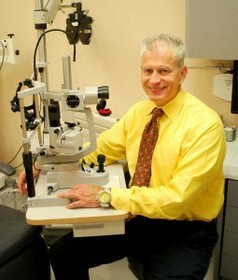 For more information about Dr. Sumsion and his practice, please visit recp-eyemd.com.